There is a certain charm and romance in getting married through a traditional Thai Wedding Ceremony. As one of life’s important moments, a wedding is made more special the Thai way with its sacred customs. 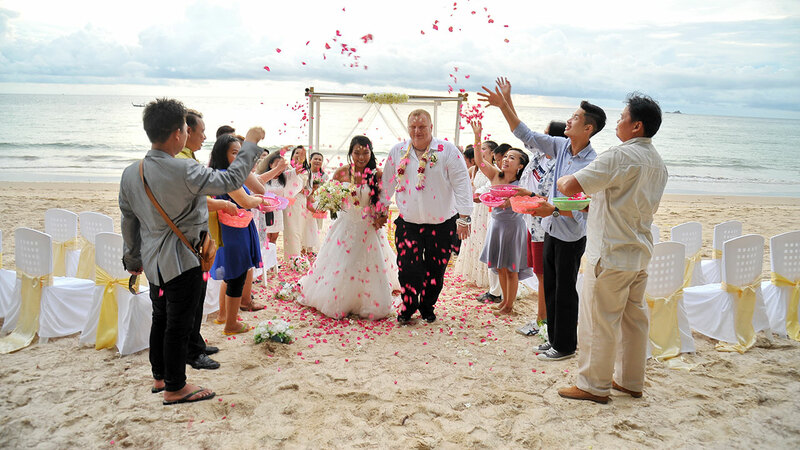 Our Thai Wedding Grand Package has this same wonder plus so much more. Firstly, before the wedding the couple embark on a photo session that can take place either at an elephant camp on back of these majestic icons of Thailand (traditional Thai weddings in the past used elephants) or at the beach. After this, the bride and groom will be blessed by monks at a Buddhist Temple before attending the wedding. The wedding proper begins with the groom, accompanied by guest, celebrant, leading the colorful "Long Drum Parade" with vibrant musicians across the garden or beach to where the vows will take place. The groom and guests will be carrying gifts and money to present to the bride’s parents (or representatives). Along the way, the groom must pass through 3 Gates and respond to questions posed by the gatekeepers. If his answers and gifts are acceptable, the bride, who has been hidden nearby, will come and join her betrothed to first pay respect to the parents, then undergo the rituals described in the Standard Package. The ceremony is completed with the newlyweds planting a "Love Tree" as a gesture of their everlasting love. Cake, Champagne and more romantic photos are the final touches before the couple is transferred back to their hotel or dinner venue. Buddhist Monks + Fees, offering packages, flower, etc. Venue floral decorations, aisle set-up and flower arch. Staff dressed in Traditional Thai Costume. Long Drum Parade with Thai Dance. Traditional Kan Mark Procession (presents for the bride's family). Thai Wish Dance & Thai Music Group background playing during ceremony. We would like to thank you and your company for that unforgettable day. It was the one of the most beautiful day in our lives. We decided to get married in Thailand not accidentally. I've been to Thailand two times before our wedding, and I realized that it is a perfect place to have a wedding ceremony. We like Thai people, their kindness and goodness. Everything went great and we are so happy! We will recommend your company to our friends. Good luck!